Global medical exoskeleton market expected to reach around USD 578 million by 2024, growing at a CAGR of 38.64 % between 2018 and 2024. The use of robots in healthcare is a growing trend that seems to have gained momentum in recent years. Researchers have introduced several medical robots designed to improve the quality of healthcare. The report covers forecast and analysis for the medical exoskeleton market on a global and regional level. The study provides historical data from 2015 to 2017 along with a forecast from 2018 to 2024 based revenue (USD Billion). The study includes the drivers and restraints for the medical exoskeleton market along with the impact they have on the demand over the forecast period. Additionally, the report includes the study of opportunities available in the medical exoskeleton market on a global level. In order to give the users of this report a comprehensive view of the medical exoskeleton market, we have included a competitive landscape and an analysis of Porter’s Five Forces model for the market. Moreover, the study encompasses a market attractiveness analysis, which provides the most attractive and least attractive market segments information by component, type, extremity, mobility, and region. The report provides company market share analysis in order to give a broader overview of the key players in the market. In addition, the report also covers key strategic developments of the market including acquisitions and mergers, new product launch, agreements, partnerships, collaborations, and joint ventures, research and development, and regional expansion of major participants involved in the market on a global and regional basis. 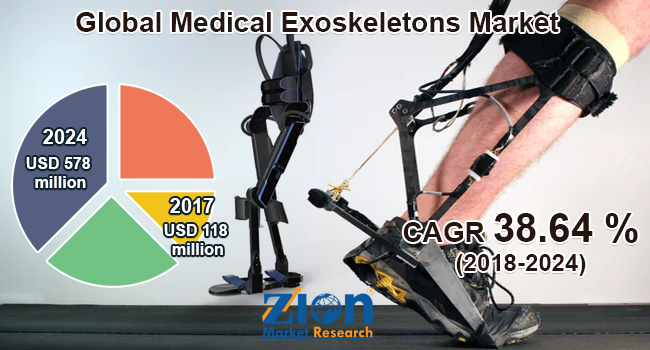 The study provides a decisive view of the medical exoskeleton market by segmenting the market-based component, type, extremity, mobility, and region. All the segments have been analyzed based on present and the future trends and the market is estimated from 2018 to 2024. On the basis of the component, the medical exoskeleton market is segmented into hardware and software. On the basis of type, the market is divided into the powered exoskeleton and passive exoskeleton. The extremity segment of the medical exoskeleton market is divided into lower extremity medical exoskeletons and upper extremity medical exoskeletons. By mobility, the market is segmented into the mobile medical exoskeleton and stationary medical exoskeleton. Some of the key players in medical exoskeleton market include Ekso Bionics, ActiveLink, Cyberdyne, Inc., ReWalk Robotics Ltd., Rex Bionics Plc, Lockheed Martin Corporation, Suit X, RB3D, and Hocoma, among others.